An abundant amount of glaze was applied to these pieces in thick layers to give off the richness of three colors: Black, blue and white. These pieces were made with highly sophisticated techniques. 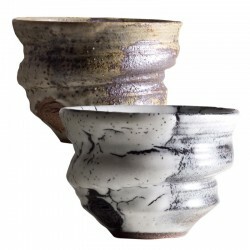 The gray uses a proprietary blending technique of glaze developed over a long-period of time. The brown is authentic pottery created with rich soil and glaze used only for premium quality tea ceremony bowls.